What started as an affinity for coffee and coffee shop culture has grown into a love for sharing quality beverages with anyone and everyone. As a locally owned and operated business, Houndstooth Coffee seeks to be an integral pattern in the fabric of the Central Austin community. Main Street Texas is alive and well … and more caffeinated. We’re happy to say that our new downtown spot at the Frost Bank Tower is open. Hosting your every coffee desire is our greatest privilege seven days a week at 4th & Congress. Come and introduce yourself. Make yourself at home. Thanks for helping us weave the PATTERN of COFFEE and PEOPLE into the fabric of downtown. (Austin, TX)—Houndstooth Coffee, known for its handcrafted, buzz-worthy beverages, is headed to bustling downtown Austin and will set up shop inside the Frost Bank Tower (401 Congress Ave, Austin, TX, 78701). Since opening in May 2010, Houndstooth Coffee has jump-started mornings, hosted meetings and assisted in getting past that 2PM wall at work. Those who live and work in the vicinity, and those who give a damn about good coffee, make the drive (sometimes multiple times a day) to its North Lamar location. The addition of the downtown location means less driving for some, and better yet, no driving for those who work and live downtown as Houndstooth Coffee will now anchor the third tallest skyscraper in Austin. The downtown location will have the same commitment as the Lamar location: Hospitality. Houndstooth hopes each guest who enters will take a step back from their daily routine to enjoy the simple, but refined pleasure of truly artisanal coffee. Each barista enjoys the romance of coffee and loves sharing that passion with guests. Every step in the coffee supply chain is adhered to with rigorous standards. From the sourcing of seasonal coffees, to the roasting in small batches, to the brewing with exacting standards—tremendous efforts are taken to ensure each guest enjoys the best coffees in Austin. While the workweek will be bustling with foot traffic from the Tower and nearby offices, the weekends will likely fare differently so the creative folks behind the creative shop have come to an early solution: Table Service. The downtown shop will prepare special coffees and food pairing events to take place only on Saturdays and Sundays. And like the original Houndstooth, the second location will continue to host a lineup of beer and wine—the perfect weekday Happy Hour or the new low key, weekend haunt. The announcement of a second Houndstooth location in Austin only marks the beginning of a big year for the shop and owner Sean Henry. There are future plans for more Austin locations in the works, as well as a shop in another Texas city, which is soon to be announced. “As Austin grows, we want to grow with it,” Henry said of the expansion. “We could think of no better setting than the iconic Frost building that anchors downtown. Our goal is fairly simple; we want to share better coffee with more people. None of this would be possible without our wonderful team of baristas who showcase just how great coffee can be, each and everyday. From our local guests to those journeymen who travel to Austin from all around the world, we are downright excited to being weaving the pattern of coffee and people downtown. As Houndstooth Coffee prepares for a year of growth, the original location will still hosts its weekly public cupping classes to help further educate coffee knowledge, whether it be for the expert or the novice looking to beef up knowledge for trivia night. Houndstooth covers all bases from tastings, to simply helping patrons understand the flavor profile of the beverage. No matter if the order is a simple black coffee or a coffee julep, each cup is brewed with thought, care, and with purpose. 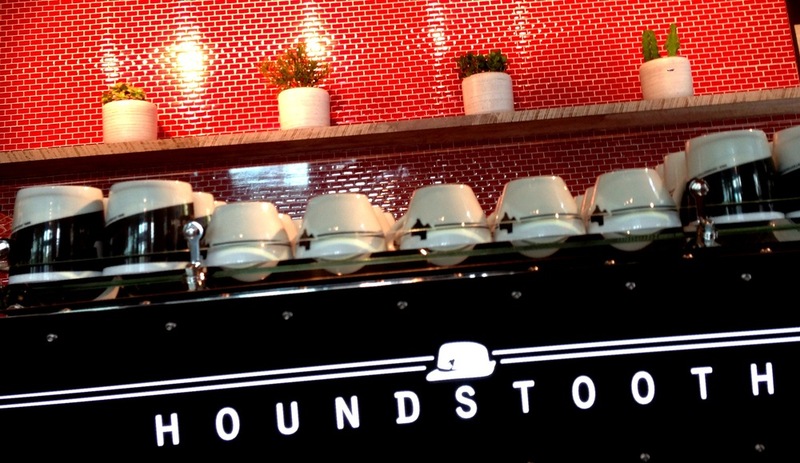 About Houndstooth Coffee: Houndstooth Coffee will open its second Austin location in early 2013. From bean to brew, every step of every coffee drink is done with care and pride. Houndstooth Coffee can currently be enjoyed at the original shop located at 4200 N. Lamar Blvd. #120, Austin, TX, 78756. Hours are Monday: 6:30AM – 7PM, Tuesday – Friday: 6:30AM – 10PM, Saturday: 7AM – 10PM and Sunday: 7AM – 10PM. Find Houndstooth online at www.houndstoothcoffee.com, on Facebook at www.facebook.com/HoundstoothATX and on Twitter @HoundstoothATX. This is the Houndstooth version of catering. We bring the cafe to you! Brew your own coffee, at home! Tips of the trade & questions answered.